concrete, string, metal, 15 x 30 x 13.5 cm. British Council. Courtesy of the artist. 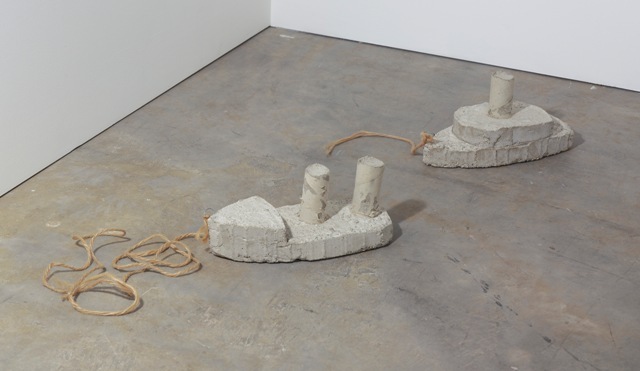 Throughout history, artists have looked to boats and the sea as subject matter, sometimes romantically, yet oftern addressing issues around migration, loss, absence, struggle and hope. Today, the subjects seem particularly relevant as images of migrants, attempting to cross into the relative safety of Europe, flash across our TV screens. The exhibition grapples with these ideas by exploring the symbol of the humble boat as depicted by diverse artists. The exhibition features newly commissioned film work by Pakistani artist Fazal Rizvi, together with historic, modern and contemporary works from the collections of the British Council and The New Art Gallery Walsall. Artists include David Muirhead Bone, Ryan Gander, Harold Gilman, Nigel Hall, Eric Ravilious, Jules-Émile Saintin, William Scott, Sarah Taylor Silverwood, Daynita Singh and Bob and Roberta Smith. This exhibition is curated by Aziz Sohail, a curator from Pakistan, who spent three weeks at the Gallery on a curatorial development residency supported by the British Council. He has received mentoring over the past year to curate this exhibition and continues to work with the Gallery team, connecting the UK with Pakistan.